Looking for an Indian-inspired vegan dish you can make at home? 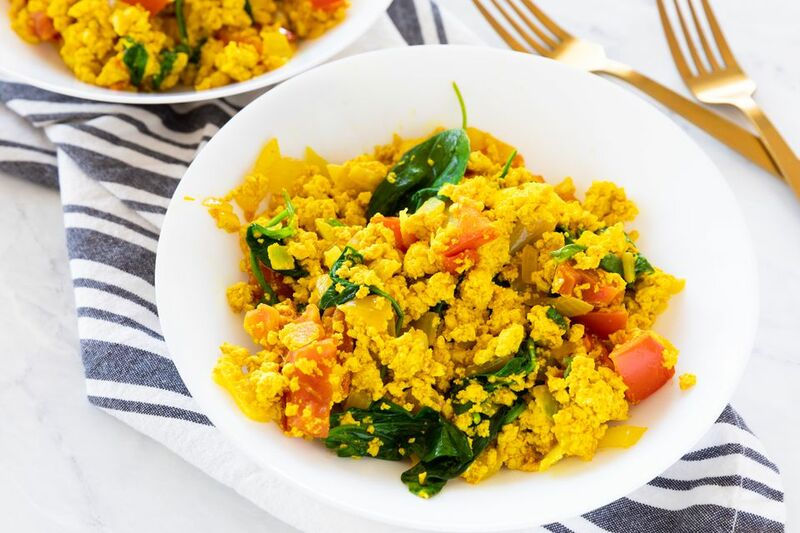 This curried tofu scramble with spinach recipe takes a basic vegetarian and vegan tofu scramble recipe and spices it up. This dish, inspired by the flavors of India and filled with healthy green spinach and fresh tomatoes, is quick, easy, healthy and full of flavor. Sauté the garlic and onion in olive or canola oil in a large skillet. Allow to cook for 3 to 5 minutes, or until the onion starts to get soft. Add the crumbled tofu and give it a quick stir. Add the curry powder, turmeric, cumin and salt and pepper to the skillet, stirring well to make sure the spices coat the tofu well. Add the spinach, cover the pan and cook for 1 to 2 minutes, just until the spinach is wilted, stirring well. High-heat oils are those with a high smoke point, meaning the point at which an oil begins to smoke and break down. When oil starts to smoke, it can lose some of its nutritional value and taste smoking. Plus, there is some evidence that cooking oils to their smoke points may release potentially harmful free radicals. Corn, soybean, peanut and sesame oils all have high smoke points and are therefore good choices for frying and stir-frying on high heat. Feel free to use more or less spinach, depending on your palate for the vegetable. Additional vegetables, such as broccoli or mushrooms, can enhance the dish.